Tattoo Blog » Please Don’t Let This Ever Happen. Tattoo Blog » Inspired » Please Don’t Let This Ever Happen. Please Don’t Let This Ever Happen. American designer Jim Mielke just creeped me the hell out. 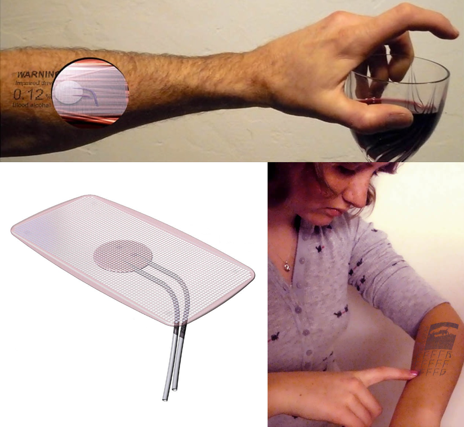 Though his “Digital Tattoo Interface” is from last year’s Greener Gadgets Design Competition held in New York City, the sheer concept of the entire thing is enough to resonate for much longer. Mielke’s design is not real – at least not yet – but the straight forward nature of the product’s presentation and potential consumer appeal leaves me with visions of a world gone convenience mad. The complete run down of Mielke’s design can be found here, but basically what it amounts to is a mobile phone that is inserted just slightly beneath the skin of the forearm. Invisible to the naked eye until an incoming call kicks the phone into action, the phone functions with as little effort as it takes to touch your finger to your forearm. Okay, yeah, the entire thing is one big piss-take on Mielke’s part in a bid to win a competition for cash, but while part of me can laugh, another part of me knows that if this thing were made available to the public tomorrow, way too many people would want it. As if people with Bluetooth headsets didn’t look like big enough douches sitting in restaurants seemingly talking to themselves, imagine a room full of people talking into their tattoos. And you thought temporary tattoos were bad.